6.30 pm – Elizabeth Prior – 4th Aniversary, John Carroll – 12th Anniversary. Nora Hurley – 1st Anniversary. Recently Deceased: Cynthia Kirwin Mairin Conlon, Rev. Mike Gleeson. 10am – Peter Heffernan – 1st Anniversary, Mary, Peggy & Bert Heffernan. 12.30pm. – Gerry O’Leary – 9th Anniversary, Evelyn Curtin – Anniversary. 6.30 pm – Fearghal O’Farrell and the deceased members of the O’Farrell & Boyle Families. 12.30pm. – Thomas, Anne Nancy, Patrick & Marie Therese Walsh, George & Christina Humphries and George Jnr. 10am – Brigid Gaughran – Anniversary, Cyril Corrigan – Anniversary. Anniversaries: Michael Gribben – 1st Anniversary, Joanna Lowry McCann- 3rd Anniversary, Charlie & Lil Higgins. Anniversaries: Ann Fegan – 4th Anniversary, Robert Fegan – 36th Anniversary, Marie Lou Brennan – 6th Anniversary. 6.30 pm – John Coughlan – 9th Anniversary, Peter O’Dwyer – 4th Anniversary. 12.30pm. – Denis O’Sullivan – Recently Deceased, Brendan Holland – Months Mind. 12.30pm. – Celine O’Carroll – 5th Anniversary, Kitty Lopez Lobanaro. 6.30 pm – Anne Mallin – 8th Anniversary, Jean O’Connell – Birthday Remembrance. 12.30pm. – Mary Kelly Anniversary & deceased members of the Ferguson Family, Kevin Naughton – 5th Aniversary. Anniversaries: William Lambie – 1st Anniversary, Maurice Power. 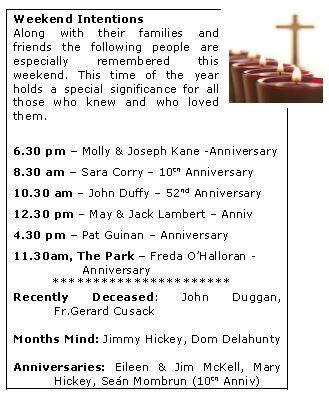 10am – Jimmy Conroy – Thank You Mass, Michael O’Sullivan – Anniversary and remember the Sullivan Family. 12.30pm. – The Most Rev. Fiachra O’Ceallaigh OFM Auxilliary Bishop Emeritus of Dublin – Recently Deceased. Special Intention of Thanksgiving. 12.30pm – Ann Golden – 6th Anniversary, 1st Wedding Anniversary for Anna Carolina & Michael Lowther. 10am – Kathleen Fisher – Anniversary, Karl Kelly – Anniversary. Recently Deceased: Joan Hickey, Dermot Rigley. 12.30pm – Freda O’Halloran – 17th Anniversary, Jim Philips – 7th Anniversary. 12.30pm – Bert Callery – 7th Anniversary, Paddy & David Flynn – RIP, Paddy McConville – 2nd Anniversary. 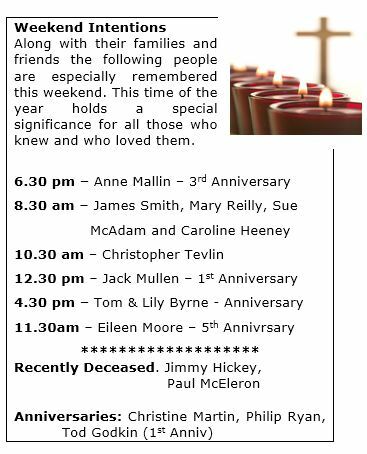 10am – Fr Jim & Fr Pat Stanley – Anniversary, Alice & James Byrne, Sheila & Jack Collins. 12.30pm – Mary Harkin – 15th Anniversary, Marie Breslin – 5th Anniversary. Recently Deceased: Moira Carter, Alan Fitzpatrick, Michael Gormley. 12.30pm – Jean O’Connell, Eamonn Raythorn, Louis Knowles – Months Mind, Kay Knowles – Anniversary. 10am – Gerry Young – 9th Anniversary, David Byrne – Recently Deceased. Recently Deceased: . Brian Brennan , Bernadette O’Donoghue, Maura Earley, Anne Healy. Anniversaries: : Mary Raythorn – 17th Anniversary, Brigid Perry, Alice O’Shea – 2nd Anniversary. Recently Deceased: Elizabeth O’Hegarty, Nancy Dunne, Sean Ward. 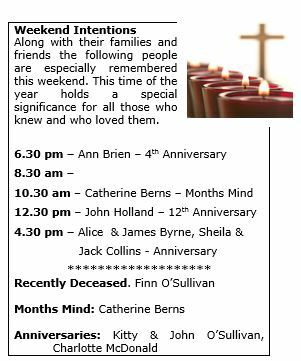 10am – Celebration of all those baptised in St Brigids Parrish in the past year. 12.30pm – Tom Feeney – Anniversary, Paddy Byrne – 25th Anniversary. 6.30pm – Nuala McGee – Anniversary, Liam Walsh – 1st Anniversary, Michael Gribben – Months Mind. 11.15 am ( The Park ) – Anne Brolly – Recently Deceased. 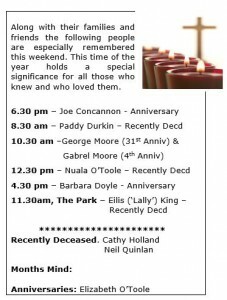 11.15 am ( The Park ) – Michael O’Boyle – Rec Deceased. Anniversaries: : John & Mary McGrath, Patricia Widdis (2nd Anniversary). 10 am – Thanksgiving Mass for all Parish Volunteers. 11.15 am ( The Park ) – Mary Hand – Recently deceased. 6.30pm – For all who are ill in our parish. 10 am – Michael Heeney, recently deceased – Jane Walsh, recently deceased. 12.30pm – Dermot Hand – Months Mind, Frances Murray, John Cluskey and Sean Cluskey. Recently Deceased: Marina Flanagan, Joan French, Dermot Hand, Patrick Turner. 6.30pm – Tommy Merriman- 9th Anniversary, Margaret Hatton – Anniversary. 10 am – James, Mary, Agnes & Moyra Farrell, Jurai & Agnes Marcinko – 10th Anniversary. 12.30pm – John Aidan Coyle – 40th Anniversary & Imelda Coyle – 20th Anniversary, Kathleen Quinn. Anniversaries: Michael (Mick) O’Hara – 4th Anniversary, Eileen Magee. Anniversaries: Baby Daniel Farrell – 10th Anniversary, Anne Byrne , Gertie Orr, Ray & Paddy Widdis. 6.30pm – Clement O’Reilly – 2nd Anniversary, James Stout – 1st Anniversary. 12.30pm -Nan Feeney- Anniversary , Sean Clare – 30th Anniversary. Recently Deceased: Michael Harnett, Samantha Plant. Anniversaries: Max Ryan, Maura Reid. 12.30pm – Bert Callery – 6th Anniversary , Patrick Flynn – 1st Anniversary , Paddy McConville – 1st Anniversary, Brendan Brady – Recently Deceased. 6.30pm – Fionnuala Doyle -17th anniversary, Paddy Tobin 1st anniversary. 10.00am – Eileen & Jim McKell – Anniversary, Nellie Lynch- 6th anniversary. Recently Deceased: Barbara Corbaliss, Bishop Eamon Casey. 12.30pm – John Holland, 16th anniversary, Nkiru Georgina Odoh, Recently Deceased. 12.30pm -Thomas Brazil Jnr – 10th Anniversary, Noel Rowley Rec. Dec.
10.00am – Fr. Jim Stanley & Fr. Pat Stanley – RIP, Michael Bolger – 8th Anniversary. 12.30pm – Eamonn Doyle – 4th Anniversary & his brother Dermot Doyle – 4th Anniversary, James & Alice Byrne – Anniversary, Sheila & Jack Collins – Anniversary. 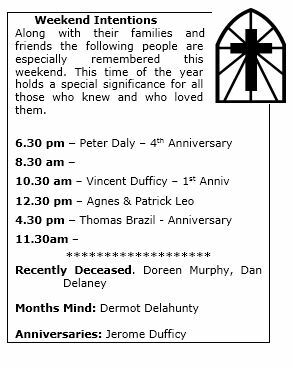 12.30 pm – Thomas, Anne-Marie, Therese & Patrick Walsh, Thanksgiving Mass for Fergus Morton. Mass of thanksgiving for all those who supported Liam during his recent illness. Recently Deceased: Seamus McNally, Vale View Close, funeral mass Monday at 10 am. 12.30 pm – Bob Conan – 1st Anniversary, Laurence Berry – 1st Anniversary, James Finegan – 5th Anniversary, Angela Mc Loughlin – Anniversary. 12.30 pm – Jim Mernagh – R.I.P. 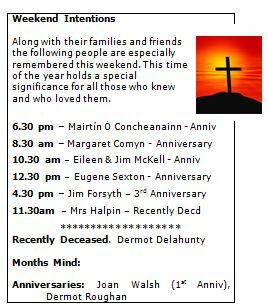 6.30pm – Anne Daly – 1st Anniversary, Desmond (Des) Ryan – 14th Anniversary, John & Maureen McCambridge – Anniversary. 12.30pm – Diarmuid O’Hegarty – 5th Anniversary. 11.15 am– Elizabeth & Michael Lyons – Ann. 12.30pm – Patrick Gillen – 4th Anniversary, Kevin, Gertie & Maurice Ward – Anniversary. 6.30pm – Veronica Corroon – 10th Anniversary and Michael Corroon – 3rd Anniversary. Anniversary: Catherine Tracey – 7th Anniversary. 8..30 am –Ann O’Meara (nee Ryan) – Rec. Decd. Anniversary: Charles Higgins (2nd Anniversary), Patrick Corroon, Marie Lou Brennan. Anniversary: Elizabeth O’Connor (1st Anniv), Sean McLoughlin, Mona Byrne. 12.30pm – Dermot Cardiff – Rec. Dec.
8.30am – Fr. Richard O’Donovan OP Rec. 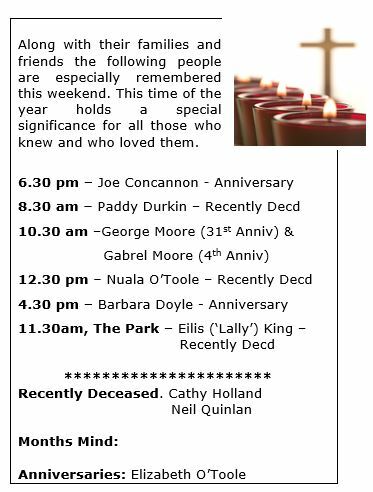 Dec.
11.15 am (The Park) – Catherine O’Shea – Recently Deceased. 10.00am – Mass for those whose anniversary occurs during May. 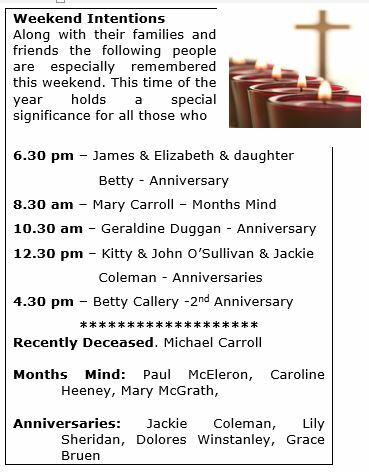 4.30 pm – Bernard & Patricia Garrigan Anniversary and the deceased members of their family. 6.30 – Maura & Noel O’Reilly – Anniversary. Anniversaries: John Mullin, 3rd Anniversary, Peggy Cronin, 1st Anniversary. 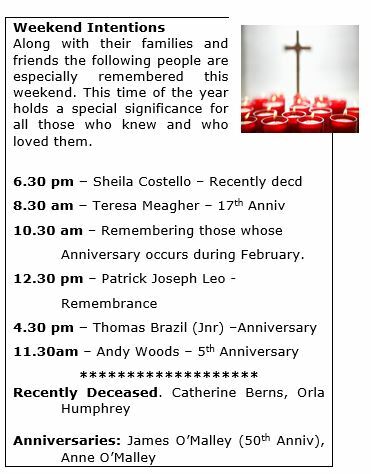 8.30 am – Mass for those whose anniversary occurs during January. In company with members of their families and friends the following are especially remembered on this Feast Day, because this date holds a specific remembrance for them. 6.30pm – Colm Brennan – Rec. Dec.
8.30 am – Shay Casey – R.I.P. Anniversary: Tony Moran (1st Anniv), Joseph Michael (7th Anniv), Christopher Tallon (5th Anniv). Along with their families and friends the following people are especially remembered this weekend. This time of the year holds a special significance for all those who knew and who loved them. Next Friday is the First Friday of the month. As usual the Masses will be offered for those whose names are on the Altar List of the Dead. If you know anyone who is housebound and would like to receive Communion on this day please contact one of the priests of the Parish or the Parish Office. 11.30am – Jimmy Berry Rec. Dec.
faithful friend and housekeeper 103yr. 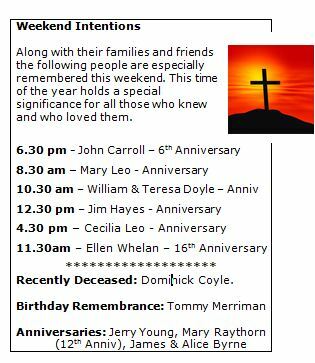 12.30 pm – Maureen & Emily Butler Anniversaries, and deceased members of the Butler & Hogan families. 11.30am, The Park – Kay Cronin – Recently Deceased.